1:18 scale collectible replica of the General Lee! From the popular Dukes of Hazzard TV series. Features rubber tires and a die-cast metal body and chassis. It's time you had your own General Lee! 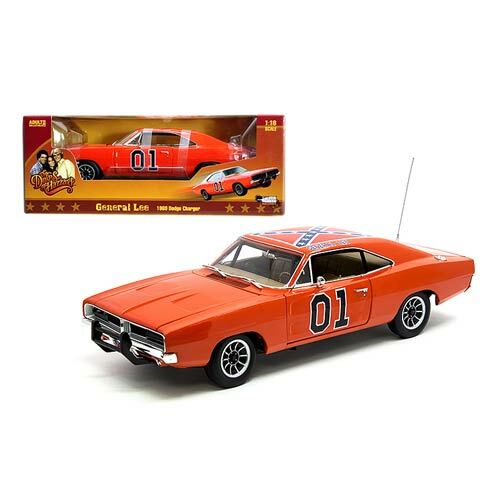 This Dukes of Hazzard General Lee 1:18 Scale Die-Cast Metal Vehicle features the Duke boys' vehicle in the popular Dukes of Hazzard TV series. A beautifully sculpted 1:18 scale collectible replica featuring rubber tires and a die-cast metal body and chassis, this fantastic version of the General Lee measures nearly 12 3/4-inches long. Ages 14 and up.